Because the sun was shining today, it didn't rain and .... just because.....I'm having my first giveaway! .....if you want a second entry, post about this giveaway on your own blog and link to my blog. Leave another comment to let me know! That's all there is to it! I'll accept entries beginning 9 am Eastern time, May 17th. I know it will be hard to wait, but, no early birds!! The giveaway is open until May 20, midnight, Eastern time. I only ship to the contiguous United States, sorry, no international shipping. The winner will be chosen from the entrants who have left a comment (s) here about my etsy store . I'll throw all the names into a hat and pick one! Easy sneezy! The winner will be contacted for their mailing address and then I'll send 'em out! And while you're at it......., On May 17th, one of my favorite crafting websites, sewmamasew, is hosting a Giveaway Day!! They will be posting a gigantic list on that day of hundreds of blogs that will be having giveaways of handmade items and crafting supplies! Very exciting... And all you have to do is leave a comment on those blogs to enter to win! eager hands is offering a choice of two prizes on her blog.....a handmade tote bag or a bundle of precut fabric quilt squares...you get to choose!!! Studio H designs is having a sweet giveaway too... gorgeous prints! Here's another giveaway at Make Mine Blue.....!!!!!! Crafty Jennifer is also offering a sweet giveaway....fabric, fabric, fabric!!!! And 3 chances to win! I really like the clear bead pieces. 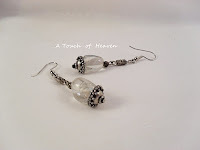 Clear glass large bead earrings). Your novelty hats are fantastic too! i love the coffee and latte watch...Also the frog hat is too cute! You make beautiful things! My favorite item is the Platinum faux pearl elegant necklace. I love the gold coin necklace. I've been looking for something exactly like that, but haven't been able to find one that's just right! thank you for the chance to win. I love the leather hair barrett. I used to have one with my name. I love the handstamped leather items! It is hard to make a decision which one! Beautiful jewelry. Fave is the aqua and teal beaded bracelet. I love your jewelry, especially the gold coin necklace/earring set. Just beautiful! I really like the Genuine Carnelian beaded heart watch. Your two strand colorful bead necklace is screaming my name!!! So bright and colorful...made me smile! I love the Frog animal crocheted childrens hat!!! I love the Gun metal gray metallic bead necklace. Very unique and gorgeous! You have such beautiful things. I love the carnelian beaded heart watch and the platinum faux pearl elegant necklace. Sorry, it was to hard to choose one favorite. My favorite item from your shop is the gun metal necklace with the cross. (heavy duty yet girly) You have lots of unique items. I also like the leather hair clips. I like the uniakite necklace. Thanks for entering me in your giveaway. My email is in my profile. I love the gold coin necklace and adore the silly kid hats! I liked the bracelets best. In particular the blue one or the aqua ones. The gun metal necklace is gorgeous! Check out my fabric giveaway at http://pitterputterstitch.blogspot.com. I like the Gun metal gray metalic bead necklace. I love the little lamb hat. I love the Leather handstamped handtooled geometric circles belt! Thanks for the chance to win! I was about to say that the blue aventurine watch was my favorite....but now I am torn between it and the lion hat for toddlers! Thanks for offering a give-away! My favorite item: Pig crocheted animal hat for babies, toddlers and children. It's so cute! I love the watches! Beautiful work! Now that I have grandkids, I love that lion toddler hat! Too cute! I love these! They're just my style! In your Etsy shop I noticed the gun metal gray metallic bead necklace. Very cute! I really like the necklace with ceramic pendant and unakite chips. It's fun! So many fun things! I think I like the Simulated tourquoise and black obsidian necklace and earring set the best. Fun giveaway. Hoping this is my lucky day. I like the baby hats. coffee and latte watch would be what I like. Very cute!! I like the leather stamped barrettes. I really like the teapot & teacup necklace the best. Green fiber optic and crystal beaded bracelet from the shop so pretty! But most importantly I love how you are obviously obedient to the spirits calling and are spreading the good news on your blog and in your business. your jewelry is so pretty! I love the blue and aqua bracelet! Love the genuine blue aventurine and lapiz necklace & earring set. The leather barrettes are a blast from the past! Love them! The Platinum faux pearl elegant necklace is to die for!! I just love it!! I heart your Genuine Blue Aventurine and Lapiz Necklace and Earring Set! Thanks! What cute earrings!! Please enter me in!!! 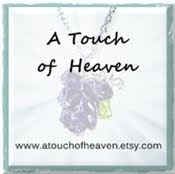 I really like the Two strand multi colored glass bead necklace on your etsy. I like Green Fiber Opic Bracelet. I love your two-strand multi-colored glass bean necklace and also got a giggle from the carrot beanie! Thank you for the chance to win! I love your necklaces! I've spent the last two days online trying to figure out how to make them. I first wanted to say I like the multi colored necklace, but turquoise necklaces always get my attention. Your turquoise and black obsidian necklace is really pretty. I also like the platinum faux pearl elegant necklace. Very pretty. Thanks for the great giveaway! Those earrings are beautiful! I also like the Genuine Blue Aventurine and Lapiz Necklace and Earring Set. I like the 2 strand multi colored necklace. Thanks for the chance to enter! your beaded watches are lovely. I like this one: http://www.etsy.com/listing/43788598/wire-wrapped-tumbled-glass-blue-and-gold The glass is so pretty blue and the gold wire sets it off perfectly. I love the leather hair clips. My mom used to wear these all the time when I was growing up. I also like the elephant and carrot hats. SO adorable. Thanks for the giveaway! Such a lovely giveaway! I love this cute froggy hat from your shop! I love the cupcake hat! I love that carrot hat! How cute is that? I love the earrings you're giving away! The baby animal hats are sweet too, but I have no babies! I used to wear these in high school and college, then I cut my hair short and got rid of all of them. Now my hair is long again...need to save my pennies so I can buy one of these! my favorite item in your shop is the two strand multi color glass bead necklace. You have many lovely jewelry creations! I love your ceramic necklace. You have beautiful work. Thanks for sharing. Lovely giveaway! My favorite item in your shop is the sheep hat...so cute! I love that little rubber ducky/chick hat for a child, soooo adorable! Thanks for the opportunity, you have great stuff. LAST DAY FOR THE GIVEAWAY !